Television arrived in Melbourne 60years ago .. and we had to stop knitting! One of the unexpected impacts of television was its effect on wool sales. Today many of us knit in front of a screen. Not just TV but iPads or Tablets as well. In fact it is now popular to knit and watch a complete series of TV programs on Netflix or other streaming services. However when Television first came into our homes 60 years ago this was quite the opposite situation. According to a recent article to celebrate the 60th year of Television - yarn sales dropped because people couldn't knit the complex patterns of the day AND watch TV at the same time! Knitting companies like Patons even designed patterns that were simple to knit for TV viewers. New patterns like the TV sock emerged. "The woollen TV socks were designed to keep family members warm so they could continue watching their favourite programs." Apparently TVs were often kept away from heaters or fires so families watched TV from a different (colder) room! What an unexpected impact on the wool industry that was. 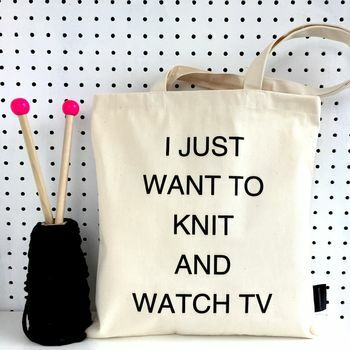 Especially since knitting and TV seem to go together like a hand and glove (or maybe handwarmers) haha!